This is a quick way to serve up tangy barbecue flavor in a hurry from your stovetop. 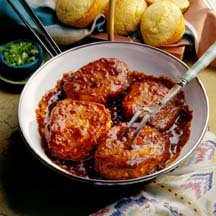 Serve these saucy chops with Bunkhouse Beans, deli coleslaw and warm dinner rolls. In large non-stick skillet, brown pork chops on one side over medium-high heat; turn chops and add remaining ingredients to pan, stirring to blend; cover and simmer for 5 to 8 minutes. Nutritional Information Per Serving (1/4 of recipe): Calories 180 calories Protein 25 grams Fat 7 grams Sodium 430 milligrams Cholesterol 60 milligrams Saturated Fat 3 grams Carbohydrates 3 grams.